tallgrass prairie studio: It's Also About...People! I've had a little time to reflect on Quilt Market. I feel like there is a glow of inspiration and motivation surrounding me that I didn't have before I left for Kansas City. It's great to see all the new fabrics, patterns and notions, but the very best part of market for me was the people. It's wonderful to connect with friends, put names to faces of internet friends and get to know them a bit and also meet new people. People don't know that I'm a pretty shy person and meeting unfamiliar people isn't what I'm best at, but let me tell you, people at market make it easy for you. Maybe it's because we all have so much in common and it's easy to talk fabric and quilts with folks who love them as much as you do. 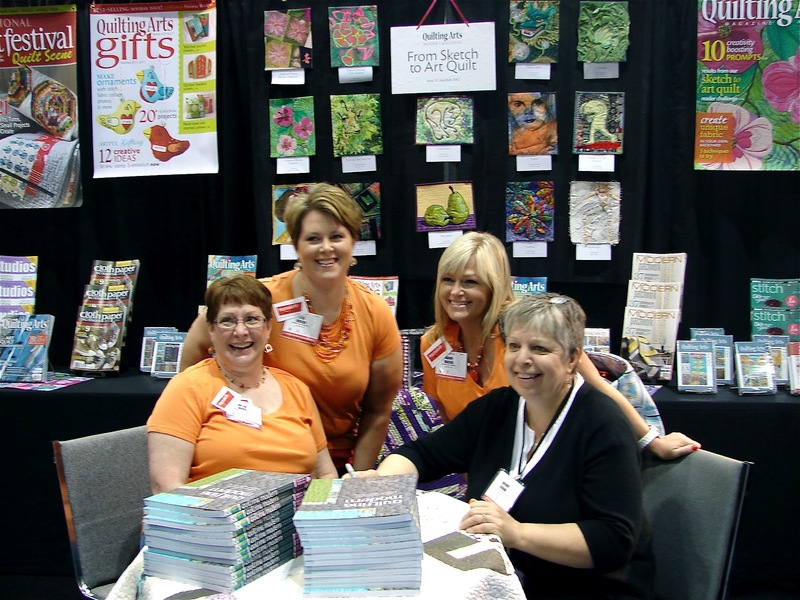 My book signing was probably one of the best quilting related experiences I had at market. Don't get me wrong, it's fun to sign a book, but the people who came were simply wonderful. Most were shop owners who were willing to share their thoughts on the book and how they sell books and what makes a book that will work for their customers and their shops. I'm sure I got more out of the experience than they did. Speaking of people, the team from Marmalade fabrics was a stellar example of quilt market folks. Tammy is my friend, but I had never met Arlene or Lisa before and they became my posse at quilt market. They were busy buying fabric for the shop and every time they saw me, they offered me water, to get me lunch, to empty my weighty bag or simply flashed a smile which goes a long way after a very long day. These are some very special ladies! I know that they stocked Marmalade with some amazing fabrics. Thanks for coming by for the giveaway. The winner of the book is Little Island Quilting and Jenny who like me thinks RK should put out an insert with all the new colors to add to our color cards wins the pins and some other goodies! Congratulations! You should have received an email from me. For more quilt market news, check out Kathy Mack's great market review on the Pink Chalk Studio blog. I thoroughly enjoyed meeting you at the Modern Meet-Up and it's funny because the first person that I ran into at the Meet-Up was Tammy from Marmalade...she was super sweet. I had a blast at Market and agree wholeheartedly that it's all about the people, I left with a pile of business cards, and a list of people I want to get to know more about. You are looking pretty GOOD!!! And I love the ladies in their matching 'marmelade' blouses! PS I am LOVING the book!!! Wish I could have been there to meet you in person, but at least I have the book and LOVE it! Thank you, thank you. I am a really chuffed winner! Sounds like it was a success. Gatherings like that are ALL about inspiration! Like going to a museum and actually being able to buy the beautiful (fabric) pieces. It was amazing spending time with Tammy. I tagged along with Tammy, Lisa and Arlene for at least half the day on Wednesday, and had dinner with them twice. They are fabulous. And it was great to visit with you as well. We just needed more time! Hooray for pins and goodies -- thank you again! glad i bought my book, didn't think i'd win. i'm also thrilled to be getting your new book We Love Color, it's in the mail! yippee!!!! I am so happy we saw each other again. You made my day with some kind, kind words. And thank-you for introducing me to Tammy, Lisa. and Arlene. I'm in love. Oh, I love Marmelade fabrics! I just knew the women behind it had to be great! I can see how you'd walk away from market feeling inspired! I enjoyed so much to meet you finally in person and to be honored by your signed book, Jacquie! It's a great contribution to a modern (quilt)world and I am proud to have such a friend! You sly devil, you! You sent me swatches of the new Kona colors to add to my color card, so I can be a cheapo! I am beyond thrilled. Those puppies are gonna get glued right in once I do a little sleuthing to assign color names. I'd love to use them in a project, but I'm thinking long-run here. The bella Bella I will most certainly be using and not saving, and I also thank you very much for the cute pins! What a fun package.